This adventure had Missy, closely followed by Chas going out to Vegas. Missy had been invited to a baking competition and was disappointed that her old nemesis from high school was one of the judges. 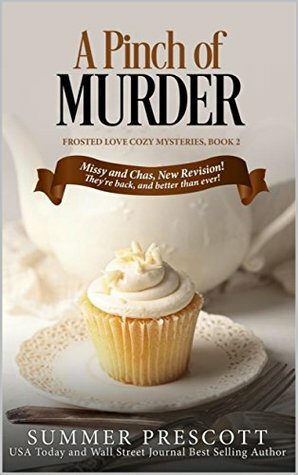 After Missy had lunch with her and the woman was murdered, the Vegas police of course thought that Missy was their culprit. That was when Chas came out to discreetly poke around and see what he could find out about the people involved in the deceased's life. The killer has their sights set on Missy and maybe Chas too, and it's up to both her and Chas to figure out what's going on before they both end up dead. This time I did actually guess who was in on it, but it was interesting to see the reasoning behind it. I loved how Chas had volunteered to watch Missy's dog Toffee and would report back to her, but it was even sweeter how he flew out to Vegas when the police were suspecting her of killing the contest judge. Sign into Goodreads to see if any of your friends have read A Pinch of Murder.